The Genteel Ladies – or, to give them their full name, The Caves Beach Genteel Ladies Painting and Tea Society – are a group of already prize-winning emerging artists that practice in a group in Caves Beach. For their first group show we were faced with the problem of how to represent this disparate group with such differing artistic styles, and stay true to the joie de vivre they exhibit across all the items they required – not just a website design, but matching flyers, a show catalogue, and social media graphics. Of course, we’d also have to include a logo design and an icon! Direction came from their nostalgically whimsical name, as much humour as a poke against pretension, echoing the late ’60s fad for Edwardiana and Victoriana. We referenced the handbills and posters for Music Halls and other entertainments from the dawn of the 20th century. With no way to quickly and cheaply use colour or artwork in their printings, these relied on using many typefaces and sizes for emphasis on a poster, as well as on stock decorative lines used to separate sections. We followed the artistic maxim ‘Good Artists Copy, Great Artists Steal’, and used the antique references as inspiration for our designs. We matched antiquated-looking fonts with text mimicking the flowerier excesses of those times. These were set in a single colour, a bold crimson lifted from the host gallery’s logo, so that there was a tie-in to them. These formed that cornerstone of the design for the flyers, and those elements were shared and remixed in parallel for the responsive website design so that they closely matched each other, no matter the format. The wordy nature of their name and the typography-based design work did make icon design a little trickier; when designing for a favicon you can’t really pack almost 50 letters in with any clarity. You’ll notice that even Facebook, with only 8 letters, whittled it down to an ‘f’. Instead we leaned heavily on the stock decorative lines idea as we’d used in the flyers and website design. Using these as a border in full black on a white square, we set the initial ‘GL’ in crimson in the centre. Even in a browser tab the antique style is recognisable, and as an icon or tile it stands out as both different yet clear, and immediately and strongly links with the full-text version. 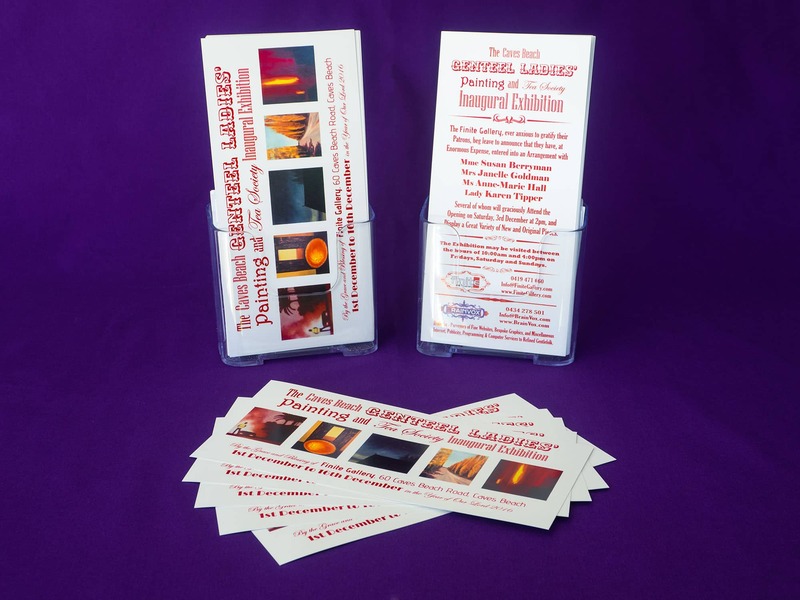 The logo and icon design then fed through to the social media graphics, which themselves complete the circle back to the flyers and website design. Re-using the remixable elements as we had earlier, we now added in the framing from the logo and icon. However, since we were less limited by size and shape as were were with the logo and icon, we could play to the varying rectangular bounds of the various social media and use more ornate borders, extending the antique and paper references as though these social media sites were the personal journals of the Genteel Ladies, with their bookplates attached. The catalogue was, unsurprisingly, again developed from the same set of typographical elements. The main difference was that for lower cost the catalogue was reproduced in monochrome. This was not a great drawback since it echoed the original historical reason for this style, the lack of cheap colour reproductive processes available. As might be expected the design held up well, looking even more the part of a music-hall handbill.